Perspetiva-Virtualis | gURROO - A new generation of innovative minds. What we commonly call as virtual is actually the potential representation of a situation capable of a constant renewal and thereby only existing in a state of possibility. Although the virtual is already embedded in the form of peregrination in images like the screens in the Kaiserpanorama and as phantasmagorian tensions in advertising and the possible interaction with the virtual is frequently inactive and mostly alienating. 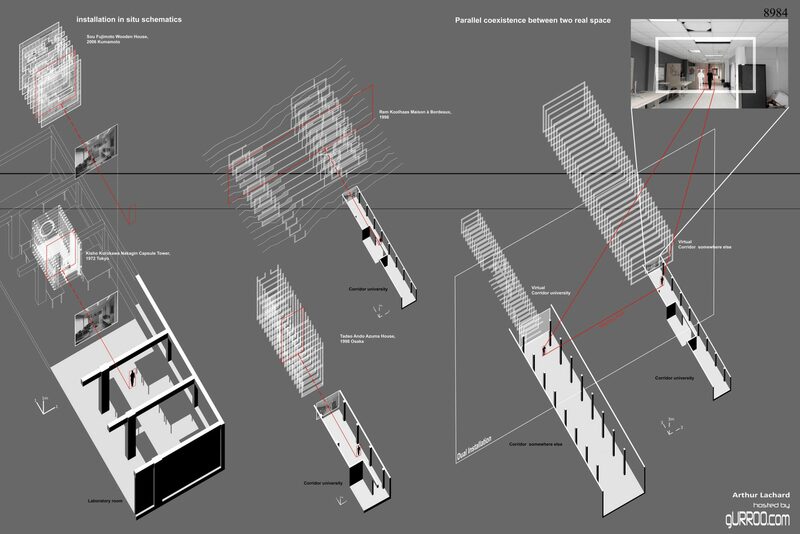 The shown project explores thereby the relationship between two spaces: one virtual and one tangible and build. First by developing the necessary software which is then applied as an installation. The corridor – or couloir – presents itself as the perfect place for this experiment. 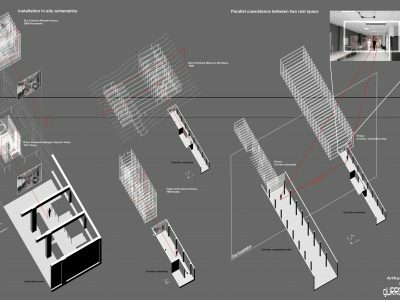 It is on one hand a generic and linear architectural element, and on the other hand its function is per se to connect spaces. Besides this two ingredients (corridor and software), the set-up requires a computer, a fixed webcam calibrated to the real space and a projection of any kind. Which will act as a mirror of the real world in which the user will see his reflection cutting the space and the building of the virtual world. Sections are normally located by an arithmetic distance inside and object and are representing the atmosphere of a given room, in opposition to the disposition logic of the plan. 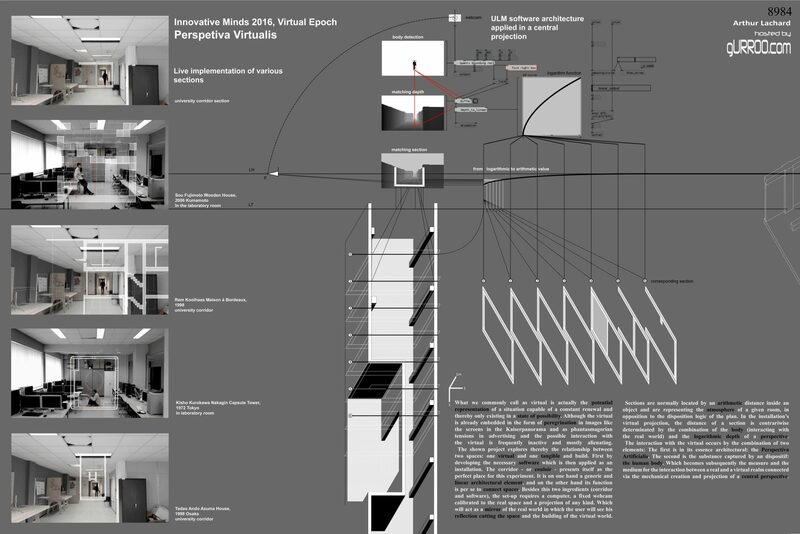 In the installation’s virtual projection, the distance of a section is contrariwise determinated by the combination of the body (interacting with the real world) and the logarithmic depth of a perspective. 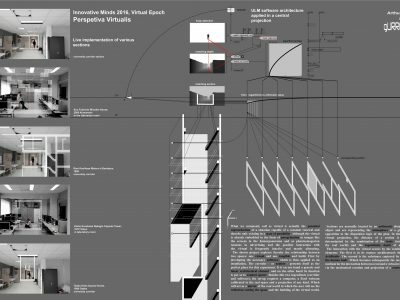 The interaction with the virtual occurs by the combination of two elements: The first is in its essence architectural: the Perspectiva Artificialis. The second is the substance captured by an dispositif: the human body. Which becomes subsequently the measure and the medium for the interaction between a real and a virtual realm connected via the mechanical creation and projection of a central perspective.